After winning my first three heats, and surging to an almost insurmountable point lead (24 points) in the Premiere League, I finished in sixth place (zero points) in my fourth heat. When I was invited to London to compete in the Premier League, it looked like it was going to be a great chance for me to get some International exposure. The Premier League works like this: a dozen world-class players compete for points in six “heats.” Six players (the four top scorers, and two winners from consolation heats) compete in the finale. Going into the finale each player has their points multiplied by $10,000. Going into the fifth heat, I was thinking that three points would lock me into the top four, and an automatic advancement to the six-player finale. I also clearly remembered my hot start at the “2006 Super Stars of Poker” on Fox Sports Net, and the way I faded in my last few heats. I was determined not to fade this time around. Thus, I entered the heat with a super conservative tact. I would wait for the other players to tango and bust themselves. Unfortunately, my five opponents also took that tact, and nothing exciting seemed to happen for a long time. My opponents were Andy Black, Vicky Coren, Ian Schafer, Dave “Devilfish” Ulliot and Tony G.
Devilfish and I were really going after each other in my third and fourth heats. In the third heat, I attacked the Devilfish relentlessly, bluffing him out three-to-four times during the heat. In the fourth heat, the Devilfish forced me to fold the best hand three to four times with well-timed bluffs. Amazingly, both the Devilfish and I kept out of each others way, whilst we both employed a conservative strategy of waiting the other players out. When we were three-handed, Black was the short stack and all-in with his Q-10 versus the Devilfish’s A-Q. At this point, it looked like the Devilfish and I were going to play heads up, which would have been both fun and entertaining for the viewers — not too mention for the Devilfish and I. However, Black hit a 10 and then went on to bust Devilfish a few hands later. For the second time in the Premiership, Black and I played heads up in a heat. In the second heat I beat him when I was the short stack. This time I had the chip lead. With the blinds at $7,000-$15,000, I called on the button with K-10. Black moved all-in for about $135,000 more, and after about 15 seconds I called his bet. The flop was Q-10-4, and Black said, “A little something for both of us.” The turn was another four, and now I needed a king or a 10 on the last card to win my fourth heat (out of five). The river was a king! There’s not much to this hand, but let’s take a closer look. I like my call with K-10 pre-flop, although many pros would have raised it up to like $45,000 or so. I do not mind Black’s all-in for $135,000 with Q-J. After all, first we were heads up; second, I had only called before the flop; so that his hand looked like it was better than mine. My $135,000 call is pretty standard here. I mean, why did he raise so much? If he had a huge hand like A-K, then he would have raised less to lure me into the pot. After five heats, I now had 32 points (four firsts! 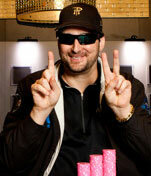 ), and was guaranteed at least $320,000 in chips in the finale. The format made it very interesting in the last few heats, as everyone was jockeying for position. In fact, the Devilfish needed to win his last heat in order to advance to the heads up match portion, and then he needed to win his heads up match in order to advance to the finals.